Most of us probably know the basic do’s and don’ts for crisis situations such as severe weather or a building fire. In both cases, the goal is safety and how to stay out of harm’s way. But what about an active attacker event? Are we prepared to deal with an aggressor at the workplace or another public area who is trying to harm us? 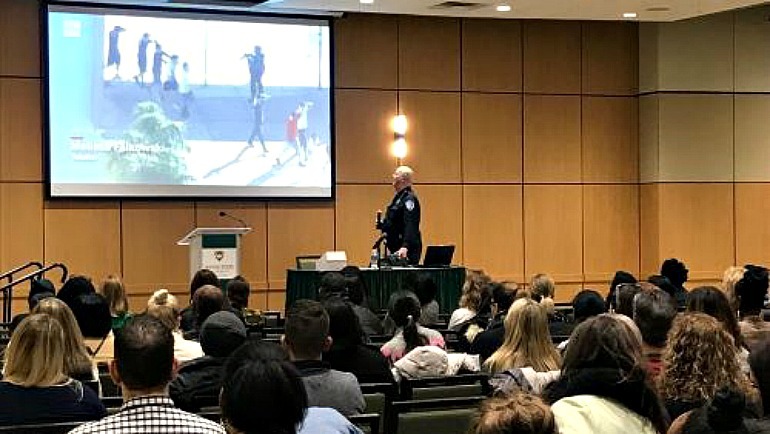 The Wayne State University Police Department (WSUPD) offers a training program to students, faculty, staff and community members that addresses what to do in an active attacker event. “Emergency Preparedness — Active Attackers” provides an opportunity to learn actions that will help you remain safe should the unthinkable occur. The training program — which is offered on campus at various locations, dates and times — includes information such as tips for reacting in sniper incidents and motor vehicle attacks, emergency preparedness videos, and question-and-answer sessions with highly trained WSUPD officers. The training also covers an often overlooked but critically important topic — what to do in those first chaotic minutes after law enforcement arrives at the scene. Another tool has also been added to the attacker training program with the debut of the "RUN! HIDE! FIGHT! - Active Attacker Training" video https://www.youtube.com/watch?v=6qeohOCMUTo . Narrated by WSUPD Sgt. Gary Voight, the seven-minute video focuses on preparation and the key words: Run! Hide! Fight! Safety tips and further information about active attacker safety is available at police.wayne.edu/active-attacker. For more information about the active attackers “Emergency Preparedness – Active Attackers” training program and to sign up for a session, visit police.wayne.edu/emergency-preparedness. Upcoming sessions will be held on Oct. 11 and Nov. 15.